This book examines the charismatic Christian reformation presently underway in Botswana’s time of AIDS and the moral crisis that divides the church between the elders and the young, apostolic faith healers. 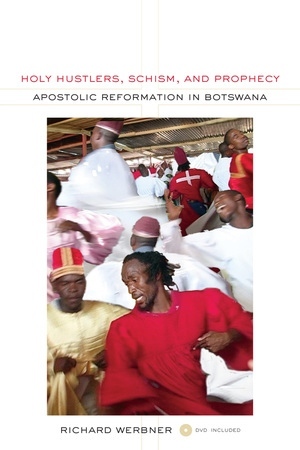 Richard Werbner focuses on Eloyi, an Apostolic faith-healing church in Botswana’s capital. Werbner shows how charismatic “prophets”—holy hustlers—diagnose, hustle, and shock patients during violent and destructive exorcisms. He also shows how these healers enter into prayer and meditation and take on their patients’ pain and how their ecstatic devotions create an aesthetic in which beauty beckons God. Werbner challenges theoretical assumptions about mimesis and empathy, the power of the word, and personhood. With its accompanying DVD, Holy Hustlers, Schism, and Prophecy integrates textual and filmed ethnography and provides a fresh perspective on ritual performance and the cinematic. Richard Werbner is Professor Emeritus in African Anthropology at the University of Manchester. He is the author of many books, including Reasonable Radicals and Citizenship in Botswana.